Harley gives us her new and current look in the new shirts being offered this month. 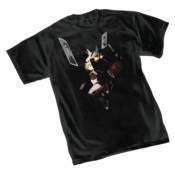 Harley Quinn: Ready features a full-color imprint on white men's or women's tee. Ante-up on the new imprinted on a black shirt. Choose your favorite. NOW AVAILABLE for sale in Canada and U.K.